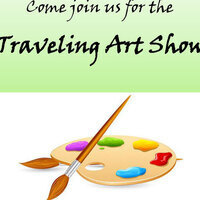 The USI Center for Healthy Aging and Wellness and the Southwestern Indiana Collaborative for Performance Improvement (SWICPI) is hosting aTraveling Art Show at USI for six days (November 7-12) featuring artwork by local nursing home residents. The artwork will be displayed in two places on the first floor of the Health Professions Center: by the Lawrence Lecture Hall (HP 1008) and Mitchell Auditorium. SWICPI is a group of nursing facilities and organizations working to improve the quality of care of nursing home residents through the use of Quality Assurance and Performance Improvement methods. Participating nursing homes are Evansville Protestant Home, Gibson General Skilled Nursing Facility, Good Samaritan Home, Heritage Center, Newburgh Healthcare, Northwood Retirement Community in Jasper, Waters of Huntingburg and Waters of Princeton.